When a new magazine flies off our busy needles and creative minds here at Interweave, we can hardly wait to see the reception on Ravelry. 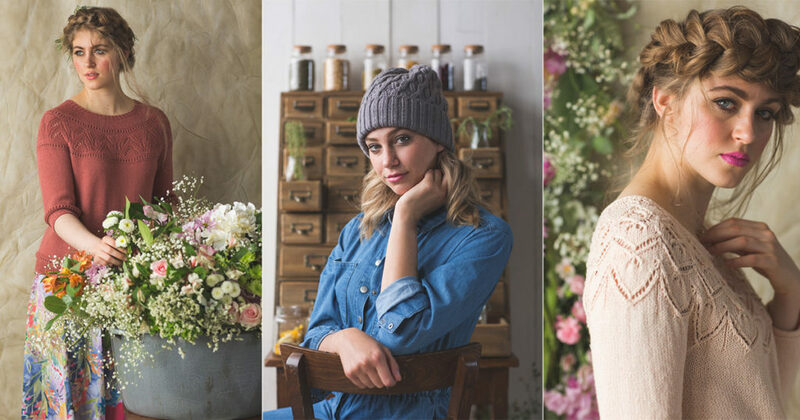 For Interweave Knits Spring 2019, your favorites are clear! Let’s countdown your top three choices and dig into some details to help you decide which of these rockstar projects to cast on first. Oh Sara Soloman, you get us. You really do. Sara’s Thyme Hat is knitted in the round from the bottom to the crown and made with a worsted merino-yak yarn. 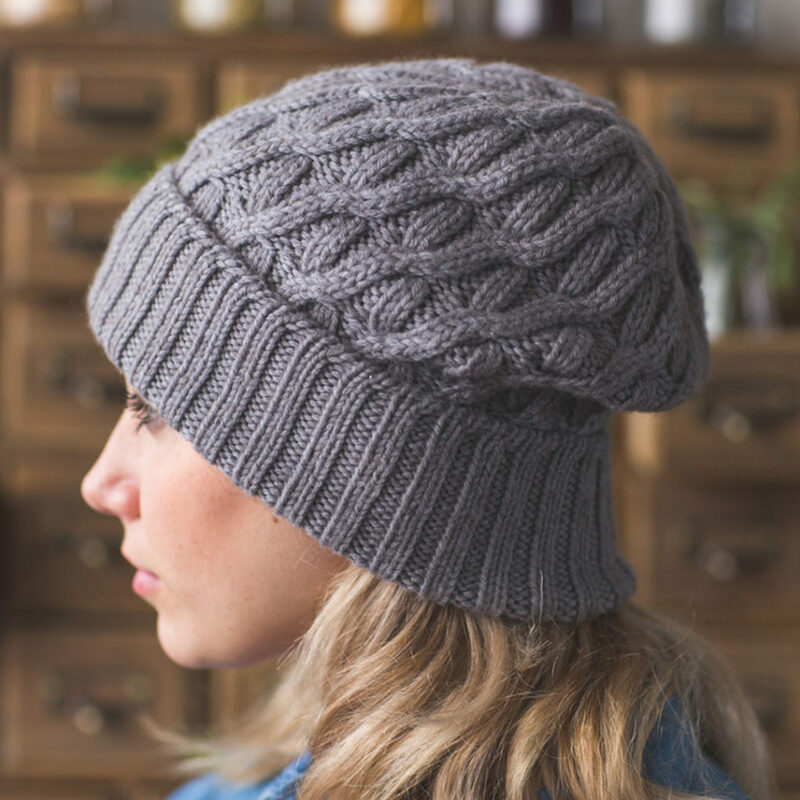 The cables make it sing with style, and the tubular cast-on creates a stretchy brim and pro-quality finish. There is versatility here, as well. Folding the brim will lead to a clean look, while choosing not too will give you the slouchy hat style you crave. Finished Size 18 (19)” circumference at brim and 12″ tall. Hat shown measures 18″. Yarn The Yarn Collective Hudson Worsted (85% merino wool, 15% yak; 197 yd [180 m]/3oz [100 g]): #402 Taconic smoke, 2 skeins. Yarn distributed by LoveKnitting. Needles Sizes 3 (3.25 mm) and 5 (3.75 mm): 16″ circular (cir). Size 8 (5 mm): 16″ cir and set of double-pointed (dpn). Adjust needle size if necessary to obtain the correct gauge. Notions Marker (m); waste yarn for provisional CO; cable needle (cn); tapestry needle. Gauge 28 sts and 23 rnds = 4″ in charted patt on largest needle. A project that belies a feeling of spring, the Celosia Pullover is executed without seaming, and is worked from the top down. The charm comes in the form of lace that defines the yoke and the bottom hem. Breezy and flattering, it is hard not to imagine this garment in a light green, a subtle turquoise, or even a very light yellow. 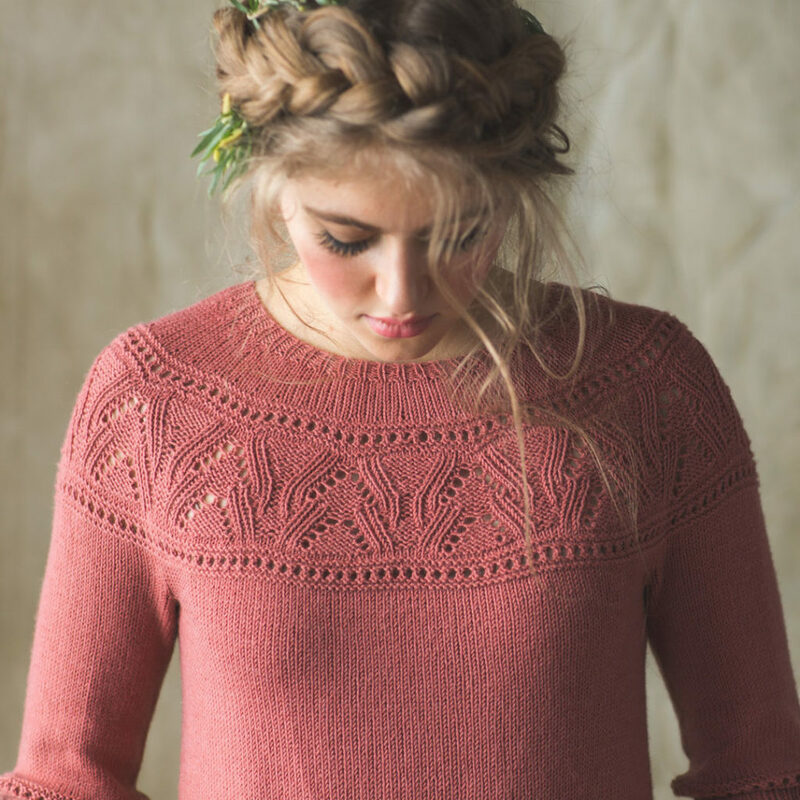 Spring has sprung within the aesthetics of this sweater, and Amy Gunderson has yet again impressed us with her classic approach to knitwear design. Finished Size 32. (37, 42, 47, 53, 58)” circumference at underarm. Pullover shown measures 37″; modeled with 3″ of positive ease. Yarn Fibra Natura Papyrus (78% cotton, 22% silk; 131 yd [120 m]/1. oz [50 g]): #229-04 dogwood, 8 (9, 10, 12, 13, 14) balls. Yarn distributed by Universal Yarn. Needles Size 5 (3.75 mm): 16″ and 32″ circular (cir) and set of double-pointed (dpn). Adjust needle size if necessary to obtain the correct gauge. Notions Markers (m); cable needle (cn); stitch holders; tapestry needle. Gauge 22 sts and 29 rows = 4″ in St st. The choice in yarn for the Rose Bush Pullover lends a unique feel to the garment that could not be achieved otherwise. Knitters, we’re talking about merino wool and baby camel blended together. This marriage of wondrous fiber yields a pullover that is both lightweight and ultrasmooth. And the design details? So eye-catching and knittable, this is the clear winner for the 2019 spring edition of Knits. Finished Size 36. (39, 41, 45, 49, 53, 57)” circumference at underarm. Pullover shown measures 36″; modeled with 2″ of positive ease. Yarn Plymouth Yarn Cammello Merino (80% extrafine merino wool, 20% baby camel; 180 yd [165 m]/1. oz [50 g]): #0022 rose, 6 (7, 8, 9, 10, 11, 12) balls. Needles Size 3 (3.25 mm): 16″ and 24″ circular (cir) and set of double-pointed (dpn). Size 5 (3.75 mm): 24″ cir and set of dpn. Adjust needle size if necessary to obtain the correct gauge. Notions Markers (m); waste yarn for provisional CO; stitch holders; tapestry needle. Gauge 23 sts and 36 rnds = 4″ in St st on larger needle. So what’s it gonna be, stitchers? Will you fall for a stellar accessory this spring, or knit your fair weather content through a lovely, lacy pullover? There are a beautiful bevy of choices for your needles in Knits. Watch Your Queue Bloom with Spring Knitting!